The Ultimate Wedding Playlist of Some Popular Wedding Dance Songs to Shake Your Leg | Wedding Tips ARE YOU A VENDOR? Weddings are incomplete without some Naach Gaana! 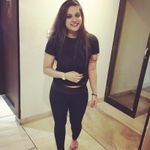 From peppy dance numbers to set the stage on fire at your bestie's Sangeet ceremony to finalising your bridal entry song, you got to figure it all. Take cues from these popular wedding dance songs. What is the most exciting part of attending your BFFs wedding? Is it the endless shopping spree? Well, yes to some extent but not exactly. For us, it is prepping up a dance routine for the Mehndi function and yes obviously the Sangeet ceremony. These two pre-wedding functions are the most awaited of them all and we'll help you understand why. 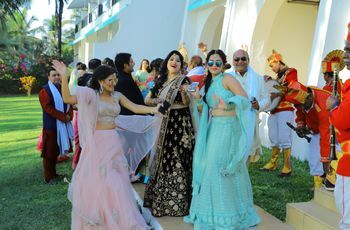 We are sure by now you must have looked at the scintillating pictures and videos from the #Nickyanka's Sangeet ceremony. We sure did and couldn't help ourselves from gawking at their Bollywood inspired dance routines. Music! Laughter! Dancing! Pictures! If you’re getting married soon then you will find these songs suggestion super helpful in building your ultimate wedding playlist. From yesteryears dancing numbers to the groovy tunes of movies, these popular wedding dance songs are just what you need to put a musical spin to your functions. Sisters before misters! Yep, the mantra for life! 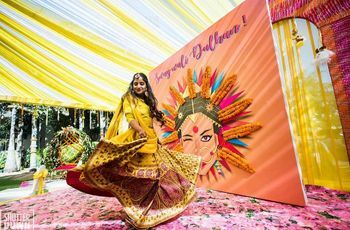 From the bride's exhilarating solo performance to the group dance which will give the groom's side a run for their money, girls run the world! Begin prepping up for your songs playlist by including some of these popular wedding dance songs. Use one of these wedding dance songs to prep up for your IIFA worthy solo performance. Put this track on, let your hair loose and unleash the diva in you. This had to top the charts. It is soulful and has a whirlwind of emotions to offer. Your handsome hunk sitting across the stage won't be able to take his eyes off of you. Thanking his lucky stars for having gotten you as a partner, he will surely feel like a blessed soul. Don't we all need some validation in life? We sure do! Believe us when we say this, this song will make the crowds go weak in the knees. Rope in a choreographer so that you get all the moves right. This song will surely translate your feelings through their soulful lyrics. Express your feelings by dancing your heart out! Yes! Take cues from Shraddha Kapoor's moves. If you want to make it even more fun, then probably throw in some rain effect on the screen of your dance stage and let the magic take over the crowd. Use one of these wedding dance songs to prep up for your IIFA worthy group performance. All your BFFs dressed in some scintillating lehengas and sarees will set the stage on fire. A proper sangeet ceremony dance number, this song will prompt all your wedding guests to start dancing wherever they may be standing. A co-ordinated performance or an impromptu one, this song will surely turn your night into a star-studded affair. If you and your girlfriends are the 'IT Girls' then Desi girl is your jam for the night. Some Latka-Jhatkas and you'll hear a few hearts break away as you and your gang make your way through the dance stage. All the eating right, hitting the gym and stretching those hamstrings for months prior to the big day has definitely brought you in shape, hasn't it? So, twist your Kamariya and flaunt that hourglass figure with an electrifying number. This is one of the most popular wedding songs in the market currently. Don't we all love Ranveer Singh and his super cool aura? Wouldnt you wish to be a cool groom just like him, unafraid to put his feelings out and bring his A-game to his performance? 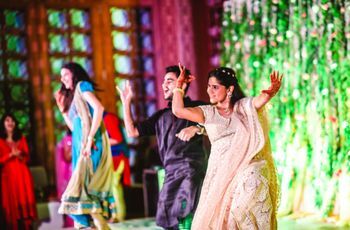 Begin prepping up for your songs playlist by including some of these popular wedding dance songs for your solo performance and to shake a leg with your mates. Chalti Hai Kya Nau Se Baara? Your bride-to-be won't be able to keep herself from shouting YES out loud! Full of fun vibes and a catchy tune, this is the perfect wedding song for a groom-to-be. We know you popped the question and she said yes! But, how about you shout out one last time, in front of all your guests and ask her for her hand in the most Bollywood inspired way there is? Put your swag on and get going! Pyaar Ka Nasha Alag Hi Hai Boss! We all have a poison to keep us going and your bride-to-be is the one poison who will keep you enticed all life long. So, let her know that she is the spice of your life with this popular wedding song. Indian weddings are the perfect occasion for love at first sight to happen. Give your groomsmen a chance to find 'The Girl.' A synchronised dance performance with your squad and some sultry looks are just what's needed for one or two to fall in love. This again is one of the most rocking wedding songs there is to break a leg on. Grab hold of some wedding props and give a rocking performance with your squad. A performance on this song is the perfect way to put a funny spin to your Sangeet night. You have a lot of room for some crazy fun and sheer joy with this wedding dance song. What good is a Sangeet night if you don't get to serenade your lady love? Keeping the feeling and the mood intact, we have curated for you a playlist of 6 popular wedding dance songs which are perfect for a couple who cannot take their eyes off of each other. This song will have your wedding guests swoon. A display of love and affection with the right dose of fun and laughter, this song is an all-in-one. Romantic yet fun, cheesy yet a concoction of rhythmic beats, you have to include this is your playlist. So much nostalgia and a walk down memory lane, this song is exactly what you need to express your feelings to your beloved. You can’t help yourself from humming as the song picks up the pace. Some dance moves, some role play, this wedding song is all you need to put your feelings on a display. Let your lady love know how she took your breath away and how in front of her nothing else matters. Take inspiration from this video and mimic the dance moves. This song is a rollercoaster of fun in its own. Which girl wouldn’t want to be serenaded in SRK style by her hubby-to-be? Nobody! We are a Bollywood driven nation and we love all things Bollywood. This song is a catch, people. This is as romantic as it can get. Pour your heart out to your man with Main Bani Teri Radha. Have your wedding videographer capture this epic moment on the reel. 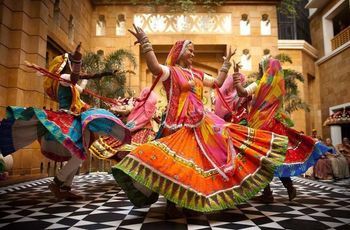 This song reminds us all of a dreamy Indian wedding sequence with the groom on a horse and the bride waiting shyly for him to come and take her away with him. Dramatic and lively, this is one crazy, romantic number guaranteed to get everyone dancing! A big fat Indian wedding is incomplete till all your Buas' Fufas and BFFs have danced their heart out together as one big happy family. Who can bring more fun and excitement to your ceremony more than your family and friends? Pick some of these popular wedding songs and create your own masterpiece. Who can stop oneself from grooving to this wedding song? This song is the ultimate wedding sangeet song which will bring the entire family and friends on the dance floor, together as one. this is as epic as it gets guys! The quintessential wedding dance song. What is better than making a rail with your family and friends? Nothing! This song will ensure that even the non-dancer in your circle gets to become a part of your sangeet night. This is the wedding dance song which will remind everyone that picture abhi baaki hai mere dost! It would be totally unwise to not include this in your wedding dance songs playlist. A wedding is an endless party and what better way to state the obvious than with this song? 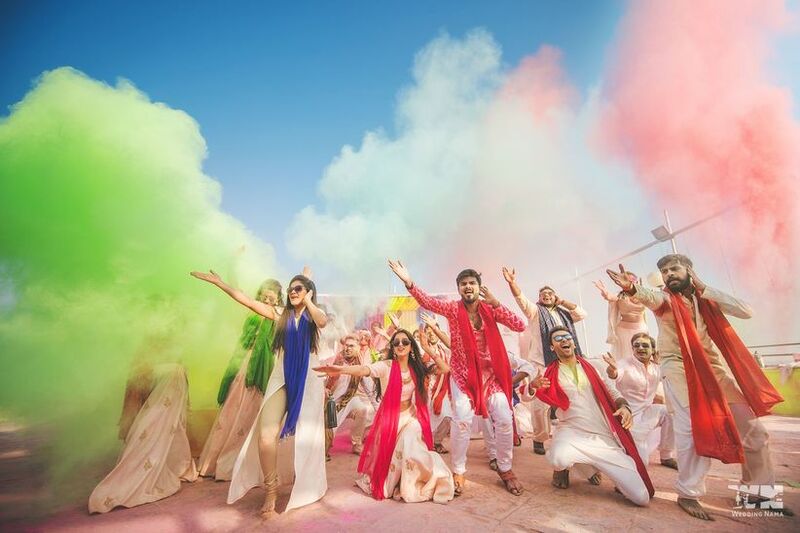 This immensely popular film that focused on an Indian wedding planning duo had people all over the country dancing to “Ainvayi Ainvayi.” this song is apt for a dance routine with your closest friends on your special day. If you want a face off with the groom squad, then there is no better song for you than this one. Add some spice and drama to you Sangeet ceremony with this song. Also, you can create a mashup of this with another one to give a competition vibe. And, we save the best for the last. Hands down this one is the perfect song for a family to get their groove on. Your entire family can come together as one to give a rocking performance.